Polyester Fiber Market Size was valued over USD 85 billion in 2016 and the industry will grow by a CAGR of more than 8.0% up to 2024. Construction industry advancements around the globe will positively influence the polyester fiber market growth. Construction is considered as an important indicator for measuring development of a country or region, as it contributes significantly to the nations GDP. It is one of the largest industries in the world, and is growing at a phenomenal rate owing to the rising housing demand in countries such as India, China, and the U.S. Flooring & carpeting is one of the most important aspects in a residential or commercial building owing to its superior finishing and looks. Product use in making a variety of carpets for flooring application will enhance the polyester fiber market in the coming years. Olefin, nylon, and polyester are the major products involved in the manufacturing of synthetic fibers which are used for industrial purposes and to produce carpets & rugs. These are also produced by using different types of polymer blends and recycled polyester. Most of these raw materials are derived from crude oils and other fossil fuels. Fluctuations in the global crude oil prices will create volatility in the raw material prices, thus creating growth barriers for the polyester fiber market. 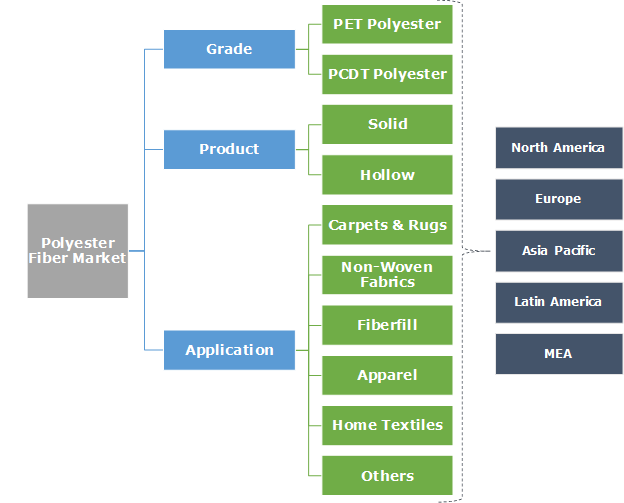 Polyester fiber market is bifurcated into PET (polyethylene terephthalate) polyester, and PCDT (poly-1, 4-cyclohexylene-dimethylene terephthalate) polyester. PET is most commonly used in the production of fabrics with superior quality and can be blended with other materials for the production of stain resistant and wrinkle free apparels and textiles. The main raw material used to derive PET is ethylene which is derived from petroleum. PCDT is formed from condensation process and is suitable for heavy applications such as furniture covering and draperies. Increasing construction activities in the developing countries is demanding for more interior decoration and furnishing owing to rising income level of consumers. Also, the life of average furniture purchased ranges from 5 to 15 years. Increasing furniture demand and rising refurnishing activities will fuel the polyester fiber market growth. Based on product, polyester fiber market is segmented into solid and hollow. Solid fiber is majorly used for production purposes and holds a significant share of the global polyester fiber market. The product finds extensive usage in home furnishings, non-woven fabric, textile products, and apparels. Solid polyester fiber market demand is said to witness exponential growth owing to the owing to its wide range of applications. The product segment was valued over USD 70 billion in 2016 and will exhibit growth at a high rate. Hollow fiber finds extensive usage in fiberfill which further finds application in pillows, quilts & protective clothing due to its warmth, high resilience and good bulk. Hollow fibers act as fillers to the material and are also used in cloth manufacturing. Increasing demand for jackets and coats, especially in colder regions of Europe and North America, will augment the polyester fiber market in the forecast timespan. The segment will grow at a CAGR of over 7.5% in the forecast period. On the basis of application, carpets & rugs, non-woven fabrics, fiberfill, apparels, home textiles, and others are the major segments of polyester fiber market, where, the others segment includes industrial fabric, etc. Rising population in the developing countries is demanding more homes and shelters. Development in infrastructure, building of commercial spaces, and rising residential complexes is creating need for furnishing and flooring industry. Polyester fiber market is largely driven by these factors owing to its extensive usage in home textiles, carpets, rugs, and furnishing materials, and will grow with over 8% CAGR. Non-woven fabrics consist of materials such as polypropylene, polyester and nylon. Growing use of these materials in the industrial use will drive the nonwoven fabrics market in the next seven years. Stringent norms and regulations regarding the use of polyester are projected to affect the growth of the segment. Non-woven fabrics segment was valued at around USD 9 billion in 2016 and will grow at a lucrative rate. Asia Pacific holds a major share in the global polyester fiber market owing to extensive usage of the product in textiles, carpets, home furnishing & décor, and industrial fabrics. Rising furnishing and flooring activities owing to huge residential and commercial construction in the Asia Pacific region will enhance the polyester fiber market position in this region. Increasing industrial and construction activities in Latin America due to availability of cost effective labor, and abundance of raw materials will result in huge growth opportunities in this region. Europe and North America is said to exhibit growth at a slower pace. The carpets & rugs segment will experience a potential market in these regions owing to the cold climatic conditions in various parts. The North America polyester fiber market was valued at over USD 7 billion in 2016 and will grow at a stable rate in the forecast period. Europe held a polyester fiber market share close to 9% in 2016 and is said to lose its share in the subsequent years. Prominent players in the polyester fiber market include Reliance Industries, Indorama Ventures, William Barnet and Son, GreenFiber International, Sarla Performance Fibers, Märkische Faser, Polyfibre Industries, Toray Industries, Kayavlon Impex, Nirmal Fibres, Shree Renga Polymers, Stein Fibers, Diyou Fibre, Silon s.r.o, and Swicofil AG. Reliance industries offer a wide range of polyester fiber and has a production capacity of 2.5 million tons per annum. The company has a significant investment in research & development to introduce new and innovative products in the textile industry. Most top players are similarly relying on extensive research & development and diversifying their product portfolio to capture the market. Polyester fiber market is strongly driven by its extensive use in carpeting and apparels industry. Increasing use of wrinkle-free and stain resistant garments will drive the polyester fiber market in coming years. Extensive use of carpets & rugs in the commercial and residential buildings will further spur the market in the forecast timespan.